Most of us like to paint ourselves in a positive light. It can be hard to admit to a mistake, especially at work where our professional reputation (and salary) is on the line. But if you start to notice that you or one of your coworkers always seems to be taking credit, seeking praise and avoiding blame, then it’s likely that self-serving bias has reared its ugly head. Self-serving bias can quickly infect your workplace, leading to a bevy of treacherous problems. If it gets especially bad, it can distort the perception of self, impair one’s ability to evaluate problems and generate hostility towards others—leading to conflict and worse. But you don’t have to be delusional to suffer from self-serving bias. It can strike at anytime, given the intensity of the situation and what parties are involved. 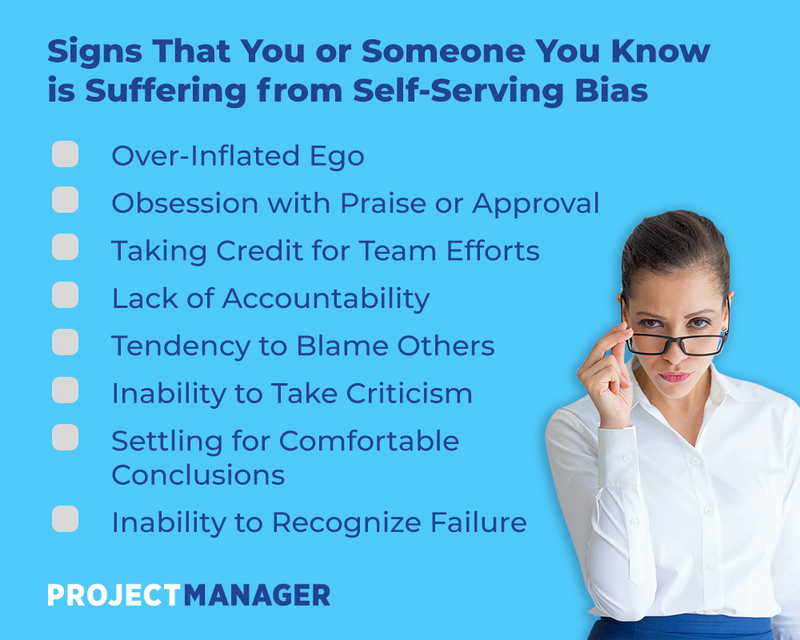 So, to help you and your team, we’re going to talk about self-serving bias, some typical examples and how it can be expunged from your workplace. Self-serving bias is a way of thinking that tends to make a person see themselves in an overly favorable manner in order to maintain a high self-esteem. It’s the type of person who is always saying that whatever success they have is due entirely to their own abilities and efforts. A person who has a self-serving bias is not going to respond well to criticism, even constructive criticism. They reject negative feedback and only see their strengths; they are willfully ignorant of any shortcomings or failures. They are often the leader who takes full credit for the success of a project without recognizing the efforts of their team. What it is, not to get overly psychological, is a perception bias that exists to protect one’s ego. It usually can be attributed to people who have a low self-esteem, as it’s a way to mask insecurities with almost a chest-puffing bravado. Clearly, it’s not behavior that any reputable leadership theory would recommend. But then, those with a self-serving bias are likely not even aware that they’re acting this way. It can be difficult to point it out and try to help them see things through a more realistic lens, as the very act of criticizing feeds into the cognitive or perceptual process being criticized. The theory of self-serving bias has been around since the late 1960s. Austrian psychologist Fritz Heider’s research showed that people make attributions based on their own needs in order to have a higher self-esteem. Another study in 1975, argues that people with self-serving bias are not driven by self-esteem but merely seek that reality be consistent with their expectations. However, if the outcome doesn’t match their expectations, then they’ll blame others or their surroundings over themselves. Everyone can probably mention an experience on the job where they came across someone with self-serving bias, even if they didn’t know it was called that. It’s common enough as to be a trope on sitcoms and an often complained about watercooler subject. Self-serving bias is exhibited at work in such examples as when someone says they were hired for a position because of personal factors, like their exceptional resume or other sterling qualities. But if they don’t get the job, then it’s because of some external factor besides their own shortcomings, like an incompetent organization or a short-sighted hiring manager. In the eyes of someone suffering from self-serving bias, it’s never their fault. Experiments and research into workplace self-serving bias posit that, in the case of a workplace accident, the victim is likely to blame external factors, while the coworkers and management are more likely to see the accident as a result of the victim’s own actions. So you don’t have to be a chronic sufferer of self-serving bias to be influenced by its distortion; it could manifest only occasionally in key instances to normally level-headed parties. It becomes clear that self-serving bias in the workplace is an obstacle to productivity, simply by blocking the ability to recognize real problems. Self-serving bias can cloud a person’s judgement and put the entire project in jeopardy because someone is unable to take responsibility or evaluate a situation fairly. Therefore, it can impact someone’s ability to read data and make smart decisions at critical business junctures. As troublesome as self-serving bias can be in the workplace, it’s exponentially more destructive when such behavior is exhibited by a team leader or manager. Imagine if the person tasked to lead a project was unwilling to see reality and was only interested in grabbing all the glory for themselves? The problems inherent in such behavior, whether intentional or not, are myriad. A leader who is more interested in taking credit for success and avoiding responsibility for failure is a corrupting influence on the team. This type of leadership erodes trust and will have a hard time retaining talent in such an environment. Any projects is subject to change and a leader must identify the risks and have a plan in place to resolve any problems that might show up. If the leader is part of that problem, they’re adding fuel to an already volatile situation. Such leadership is going to bring down morale, and team members will be reluctant to speak honestly, all of which chips away at the effectiveness of the work. Leaders also need to communicate, but clear and effective communications is based on honesty and listening. If a leader is more interested in laurels and praise, then the words they speak are likely going to be used to advance that agenda. The only mandate for a leader is to get the project done, on time and within budget, meeting the expectations of their stakeholders, not get a medal for doing it. However, a leader with a self-serving bias can be surprisingly effective in certain circumstances. For instance, it can help a leader preserve in the face of adversity. They might be more motivated to push forward, thinking that the issues they’re facing are not related to themselves personally but the environment at large. But this is a small advantage to a behavior that is overwhelmingly a disaster for a leader. People with this cognitive bias are always blame someone or something else for whatever problem or failure there is. This is the opposite of the famous quote by President Harry Truman, “The buck stops here.” Rather, a leader with self-serving bias passes the buck. The first step to changing your behavior in knowing how you’re behaving. This can be problematic if you’re trying to tell someone who is managing you that they are acting with self-serving bias. However, often we are exhibiting these behaviors, so before you start accusing others, be contemplative and see if you’re guilty of self-serving bias. If you are, then read up on it. There has been a great deal of research, articles and books on it. The more informed you are, the more you’ll be able to be aware when you’re acting in a self-serving bias way and develop tools and techniques to help you stop. Another thing to learn is that there is value in failure and being accountable for one’s actions. Failure is an inevitable part of life. It means you’re taking risks, stretching beyond your comfort zone and other clichés. But clichés are based on old truths and failure is a way to learn and grow. Being accountable for your actions is a sign of maturity and one that will earn a leader respect. When a team respects their leader, they will work harder and better for them. Also, find ways to give others credit; this will help you adjust your behavior. It allows other people to succeed and share the success, which is again a way to bond with teams and motivates them to do their best. Helping others get recognition can be a boost to your self-esteem and make you feel better about yourself, too. Whether you or someone you work with has a self-serving bias, the need to have a tool to help you manage your work is always important. ProjectManager.com is a cloud-based project management software that gives you a real-time dashboard with the most up-to-date and accurate data possible to help remove bias from the equation. Try it out today with this free 30-day trial. The post The Dangers of Self-Serving Bias at the Workplace appeared first on ProjectManager.com.